As you strive to make your home or business as beautiful and as valuable as can be, one of the areas that is worth your consideration is your countertops. 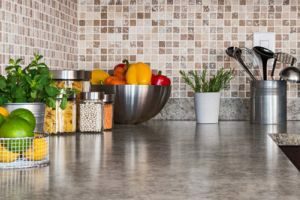 While countertops might seem somewhat insignificant in the long run when there are larger areas such as your roof to consider, countertops are STILL worth your time. After all, you use them daily — so why not make them as beautiful as can be? You can make them every bit that beautiful AND incredibly durable — all you have to do is get natural stone installed on your countertops! Of course, stone doesn’t naturally grow at the ninety-degree angles needed to make a truly beautiful countertop. How, then, can you use natural stone for the purpose of making your countertops as strong and as beautiful as can be? Easy: Have them fabricated by a stone-cutting expert! Stone fabrication is, as you might have gathered, the process by which natural stone is cut in such a way that it is useful for your home-improvement projects. Luckily, you don’t have to wonder about the process or if it’s worth going through! All you have to do is read on to see what few (and what simple!) steps are required to provide you with the most beautiful custom-cut countertops possible! First and foremost, your stone-cutting technician will come into your home at a time that you schedule beforehand, and then he or she will measure all of the countertops you need cut. This process is fast and simple, and it should take up less time than you usually spend on an average lunch break. No fuss, no muss. Simple enough, right? Process still sounds pretty simple, doesn’t it? Don’t worry: It only gets easier from here! Next, based on the measurements he or she took, your technician will draw up a plan for your countertops. Based on the size of counters and the material needed, your technician will also be able to provide you with an idea of the price range you can expect for the work. Your only involvement during this step: Say “yay” or “nay”! That’s it. If the price looks reasonable, jump in! If not, you can simply terminate the project at that point or perhaps discuss the possibility of using a different product at a lower price. Now for the first step that won’t involve you in any way whatsoever: Your technician will head back to pull and fabricate the stone you have settled on! With this step, you can simply be at work, asleep, on the couch watching the game, or out enjoying a few drinks with friends. You’re completely uninvolved! Getting the countertops of your dreams is sounding easier and easier, right? And with only one step left to go! Last but CERTAINLY not least, your technician will return to the jobsite (your home or business) and get those beautiful new countertops installed! While you might have to be present for this step, you certainly won’t have to do anything BUT that. You can still watch the game or enjoy a cold one while you wait for your beautiful new countertops to get put in. Bim, bam, boom, that’s it! If this process sounds absolutely doable to you, then your choice should be easy: Get it done! But to make this process as quick and as satisfactory as can be, you need to get your custom stone fabrication handled by an experienced and reliable expert. And with over three DECADES of experience in the stone fabrication business, we at Kennedy Tile & Marble Inc. can promise to make this process every bit as smooth and satisfactory for you as can be. In your endeavor to make your home or business as beautiful as can be, you can’t go wrong with custom-fitted stone countertops. And to get that, you’ll need a custom stone fabrication. To get the smoothest and highest-quality stone fabrication, have yours handled by an experienced pro — such as the tile and marble folks at Kennedy Tile & Marble Inc.!